Maples are among the most popular trees for the garden, especially as shade trees. No wonder! With their iconic leaves and spectacular fall colors, these hardy trees will grow in many climate zones and many different conditions. As well, there are so many to choose from! 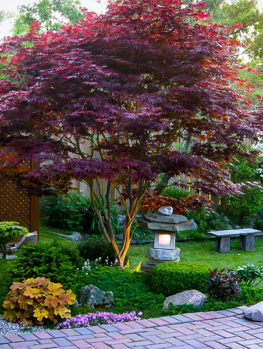 Choose a grand Sugar maple or the smallest Japanese maple – there is a maple tree for every garden. 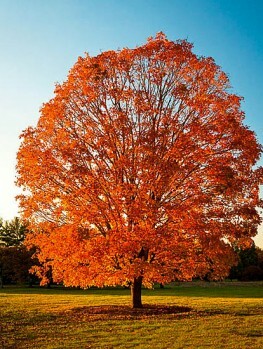 Maple trees are usually healthy and live for many, many years. There are a few diseases that can occur and it is helpful to be able to recognize them and even more helpful to know what steps can reduce the chances of them occurring. So what signs might be telling you that your maple tree is in trouble? This is seen as black, roughly circular spots on the leaves. These can be very small or up to ½ an inch across. Each circle is surrounded by a yellow margin. There may be one or several spots on each leaf and leaves with a lot of spots may turn yellow and fall prematurely. This disease is caused by a fungus called Rhytisma. 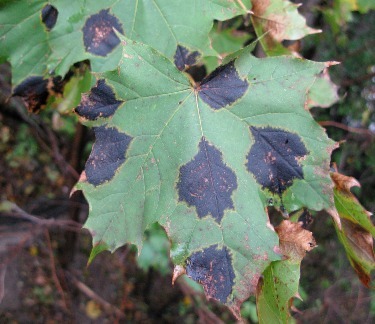 Maples can show several different leaf-spots that are usually brown, scattered all over the leaf and sometimes join together into larger areas of dead tissue. These are hard to accurately identify and are caused by several different fungi. This leaf disease causes large, irregular dead areas to develop around the edges of the leaves and in their centers. The leaves will shrivel and then fall from the tree. The dead areas are often limited by the veins. Several fungi can cause this disease, which is often seen suddenly when the weather is suitable, and then not seen much again for several years. In hot, humid summers maples can sometimes show a white, powdery coating on the leaves, almost like flour has been thrown onto them. This is another fungus disease, usually caused by an organism called Erysiphe. Will These Diseases Harm My Tree? Although these leaf diseases can be unsightly and cause trees to lose a lot of leaves during the summer, they are very rarely harmful and next spring the trees will grow normally, with lots of fresh, healthy leaves. Trees that are well-watered, fertilized and cared for with usually develop fewer leaf diseases. If you have a severe outbreak, make sure you rake up the leaves and destroy them, as these diseases go through the winter on old leaves and then re-infect the trees next summer. Sprays and chemicals are rarely needed, as your tree will normally never be seriously harmed by these diseases. This is a much more serious disease that affects all kinds of maples, but Sugar Maple and Silver Maple are the ones most commonly affected. It can also affect Japanese Maple. This disease is another fungus that enters through the roots and blocks the water passages inside the tree. The lack of water and nutrients flowing through the tree causes branches to die; at first small ones high up in the tree and later whole limbs lose their leaves and die. Often this is first noticed when a branch starts to show fall colors in late summer, long before other trees begin to color at all. After a few years no more leaves will grow and the branch will die. Sometimes the disease spreads quickly and a tree may die in a few years. Other times a tree may live for a long time, slowly becoming weaker and less attractive, but never dying completely. You can often confirm that you have Verticillium Wilt by taking a branch that is showing these symptoms and cutting it across. You will see brown staining of the wood in a circle a little below the bark. This confirms you have the disease, but its absence doesn’t mean you don’t. Since Verticillium enters through damaged roots, it is important to try to not damage the roots of your maple trees. If you need to have trenches dug and roots have to be cut, use sharp tools and make smooth, clean cuts. Don’t leave torn, damaged roots when the trench is filled. If you have a lot of disturbance and construction around a valuable tree, it is a good idea to have a tree surgeon come in immediately afterwards and use a root-feeder to fertilize your tree. The will boost growth and help the tree protect itself from any Verticillium fungus that has entered the tree. There is unfortunately no cure for this disease, but of course most maples will not contract it. Japanese maples in particular, but other maples too, especially when young, can suddenly have the leaves dry out, first around the edges and sometimes the whole leaf. This is not a disease but the result of too much sun, often combined with lack of water. This will usually be seen during a long hot and dry spell, so remember to keep your tree well-watered when the hot weather arrives. If you have a Japanese maple that regularly dries up like this in the summer, despite watering it well, you might consider moving the tree into a shadier part of the garden. This is easily done during the winter while the tree is dormant. Dig it up with plenty of soil and water it thoroughly in its new location. It might look like maple trees have a lot of problems, but really they are usually healthy and among the best choices you can make for your garden. If you watch out for diseases and know how serious they may or may not be, you will enjoy your tree for many years. Why has my red maple leaves turned green and no longer have the dark red color. Is it growing in a shady spot? Leaf color in red trees is influenced by shade – they turn greener in shade. We think our maple tree has anthracnose disease. It is a schwedler maple. We just put red bark-mulch around it, and that’s the only thing that’s different. Our other maple is not affected, & we did not put red bark-mulch around it. It just started shedding leaves 2 days ago. There are black spots on the leaves, and the leaves are dried and curling up. Please give us your feedback. We see leaves all over the tree including way up on top. The tree is about 41 years old, & we planted it. Thanks for your feedback. This is a pretty common diseases in cool, wet springs. Have you had one? But don’t be too concerned, as it doesn’t affect the whole tree and its long-term health, just the foliage. Even if they defoliate a lot, a tree as old as yours will not be hurt. I doubt it was the mulch, unless it was contaminated with leaves from a tree like maple or ash, that had this disease on it. Hard to say, although that is always possible. This link has a good picture of anthracnose.The other possibility, although it is early in the season for it is tar spot, like this. Notice that the black areas are very black, and neater in shape. In either case, both of these are pretty harmless in the long-term, and vary from season to season, depending on the weather. I planted a maple tree last yr and it budded out and was leafed out really well and then all the leaves shriveled up and turned brown what caused this ? is my tree dying ? the most likely cause is dryness. A new tree often has no roots outside the old root-ball from the pot, which can dry out when the tree takes up lots of water to leaf-out. So the soil may look damp, but there can still be insufficient water. Start watering, and give it a long, slow soak once a week. Let a hose trickle slowly by it for a couple of hours. There is a good chance it will leaf out again, so don’t give up just yet! Had a large (~5″ trunk) Autumn Blaze Maple planted last fall. Was doing fine all spring, but is now loosing leaves at the end of it’s branches on the windward side and developing a light green fungal looking growth on its trunk. The growth has flowery-snowflake like patterns to it. Is something to worry about? Do I need to water more; if so, how much? Without seeing it, the growth sounds like lichen – that would usually be on the north side of the trunk. If it is, nothing to worry about. A large tree like that will need plenty of watering during the first few seasons, so that could be the reason it is loosing leaves – they dry faster on the windward side. A long deep soaking over the whole root zone once a week should do the trick, but it should be long, to get the water down where it is needed. We have two 25 year old sugar maple trees in our yard – always beautiful. This spring, one started to produce leaves, but then suddenly stopped. The tree has remained mostly bare, with sparse “baby” leaves with curled up brown edges. The second tree produced leaves, but they did not completely “unfurl” either – look smaller than usual. An arborist told us that both trees were “girdled” and also had mites – nothing could be done but removal. Now a nearby red ornamental maple in our yard has suddenly shriveled up and looks dead after being beautiful and healthy this spring. What is happening? We are sick – these trees are the center of all the beautiful landscaping in our yard, and provide us with needed privacy. Are there no options to save our trees? Hm, it sound like maple wilt, Verticillium to me. Have you had any excavation done in the garden in the past few years? Changes in level? This disease often enters through damaged roots. I would ask another arborist for an opinion. Mites can cause specific patterns of curling to form, but they are not usually a serious problem and vary in intensity from year to year. This doesn’t sound like that. Get a second opinion. If it is wilt, something to try is root feeding, which an arborist can usually do. This involves injecting fertilizer into the soil around the root system, and can cause a tree to ‘grow away’ from the disease. Definitely worth a try before giving up on the trees. We have a mature maple stand in our yard. This year several large branches are dead. The living tree has light yellow/ greenish leaves. I notice that even on the live tree small branches at the very top are now dead. Yes, it does sound like it, and if several branches are already dead, it is probably past saving. I suggest you have it taken down. Sorry you are losing a mature tree – it is always sad when that happens, but this disease is hard to control, and does destroy a lot of trees. If you want to replace it, choose something that isn’t maple, perhaps an oak. I have a 12 year old green maple tree. For the last two years it has started green in spring and then turns yellow all over and the top leaves start to droop and turn brownish. The Senske tech said it was a micro nutrient deficiency and did a deep nutrient treatment and sprayed the tree with an iron supplement. He said to deep water it for a couple of weeks and I have, every three days, along with the normal daily lawn watering. We live in southeast Washington State which is hot and dry. Any nothing as to why it is doing this and how long it should take for the treatment to start working? Could it be something else? All the plants near it (next to it in fact) are healthy. The leaves on our very very old sugar maples have round raised spots on them. Also what is the white spider looking stuff that comes from the tree. They float around and makes everything sticky and gross. What can be done. It is such a mess. This year it’s been going on 2-3 weeks of this sticky mess. Rhytisma-spot leaf does this disease spread to other trees or plants, on the news they announced a large amount of this has affected many maple trees, they said to try to get rid of the leaves to control disease, does it spread to other plants its in tact with? This is a common disease in certain years – then it goes away for several. It is mostly affected by the weather. Usually called ‘Tar spot’, it only affects certain maples, has no effect on other plants, and hey, it doesn’t even hurt the maples to any significant degree – just makes them look unsightly. Clean up the leaves and bag or burn them in the fall. This helps prevent re-development the following year, but not if your neighbors don’t do it too! I have a recently planted autumn blaze tree (18-24ft) that has recently received a lot of rain. The leaves are turning red and yellow like fall with the tips turning black. Is there something I can do?? I am not sure what this might be. I think you have a Crimson King Maple, if it has purple leaves, but I have never seen white spots on it. If they are powdery, and rub off, it could be powdery mildew, that can occur in hot, humid weather. If it is, then you don’t need to worry. It is unsightly, but not harmful. Next year it will be back with perfect leaves again. We have a 30+ year old Norway maple that sprouted most of its leaves in the spring but never matured to full size. In late July they all started turning brown. They are now falling off but slowly, like the tree is trying to hang on. No excavations anywhere near our tree, no changes in the ground levels but this year was very wet, and I notice some of the leaves on several other maple trees in the neighbourhood are starting to turn now. ANY thought or suggestions would be greatly appreciated. Scratch the bark on some of the shoots with no leaves left. Is it green underneath or brown? If it is green, then the tree will probably be fine next year. If it is brown, then you may have Verticillium wilt disease, which is usually fatal, I am afraid. See what happens next year. If the tree leafs out normally, then no worries. If some branches are dead, and produce no leaves, then it is probably wilt. An older tree like yours may last several years. If it does seem like wilt, get some lawn food and sprinkle it all around the roots of the tree – often if you give the tree a big feeding like this it will put on a spurt of growth and grow away from the disease. It is certainly worth a try if you see dead branches next spring, but not a guarantee, I am afraid. I have two big maple trees in my front yard. They both have spotted leaves. I’m hoping to return then to healthy trees as I really don’t want to lose them. We just bought this house last summer and they’re my only shade. Please help. We have had a lot of reports of this problem, but don’t worry, its not serious. I expect the spots are black, yes? This is a common disease in certain years – then it goes away for several more. It is mostly affected by the weather. Usually called ‘Tar spot’, it only affects certain maples, has no effect on other plants, and hey, it doesn’t even hurt the maples to any significant degree – just makes them look unsightly. Clean up the leaves and bag or burn them in the fall. This helps prevent re-development the following year, but not if your neighbors don’t do it too! You are not going to lose your trees. next door to us, the people rent . the 25 foot Maple has dead limbs and tree’s leaves are turning a dull yellow or brown. the brown ones are dropping. many of the limbs and top part of main trunk is white. I spoke to renter and they do not like what is happening either. We live in va beach, 5 miles from ocean and possible hurricane track. is this tree dying and should they ask owner to have it taken down. it seems a hazzard to our house and theirs. The only strategy that has proved sometimes successful with Verticillium is root feeding. Hire a tree care company with root feeding equipment – its a spike on a hose connected to a pump and a tank – and have them feed next spring with a high nitrogen fertilizer at the highest dose they can. This sometimes causes a flush of new growth in the trunk, which cuts off the disease further inside the tree, where it can’t do any harm. Have them remove all the dead branches, and everything with that dark ring in the wood. No guarantee this will work, but it has been reliably reported to be successful some of the time. Taking a long time to die is typical, and suggests a weak form of the fungus, so the odds are better that you will be able to lock it inside successfully. Good luck! Do the diseases carry through the seeds? Almost no plant diseases are transmitted through seeds. However seeds can be externally contaminated, so seedlings can become infected. Best to only collect seed from healthy trees. My Maple tree is dying at the top the lower branches have spots like a round fungus on them. what is this? the tree is about 20 years old. I had a younger one in the back yard with the same symptoms. we cut it down . it had more dead than live limbs. Hi Linda, hard to say much without knowing what kind of maple trees they are, and seeing the spots. If they are sugar maples, my guess would be verticillium wilt, which often causes upper branches to die first. The spots are probably unrelated, and something minor. I would call in an arborist. My maple tree has white/light colored splotches on the bark all over the tree. It is not lichen as there is really no texture to the spots. The tree is about 20 years old. It’s had that for a few years. I haven’t noticed any other symptoms but I did notice a branch with leaves starting to shrivel in the fall well before the leaves started turning color for winter. What is this and do I need to get the tree treated? This sounds like another case of verticillium wilt, which has become a serious and spreading disease of maple trees. The patches on the bark probably cover dead areas beneath – you could remove one or two and check. The early shriveling in fall is very characteristic of this disease. I suggest you have a contractor come in and give the tree a root feeding. A probe is pushed into the ground and fertilizer pumped down into the roots. This can sometimes allow the tree to outgrow the diseases – no guarantees, though. Otherwise, you will probably see a steady decline, with that branch you mention suddenly dying completely. Trees can live for years though, so you may be lucky. Sorry I can’t be more positive! I have a silver leaf maple. 30 years old, 14 inch trunk. It is dripping sap from the limbs/leaves. This started as soon as it started budding out. We’ve had an EXTREMELY dry winter her in NW New Mexico. could it be from lack of moisture? I am not so familiar with gardening in your area, but this might help. It’s from Nevada Dept of Ag, so it seems relevant to you. It doesn’t sound good! I have a huge sugar maple. Last year we had blossoms that dried up into crusty black balls. Looks like it has spread as more of the tree is affected. Any clues? I assume by blossoms you mean the small red flowers that develop into seeds. These are rarely noticed by most people, and I have never seen the problem you describe. Don’t take this as an insult, but are you sure your tree is a maple? It is just that what you describe sounds like Ash tree flower gall, a common problem caused by a tiny mite. Maple trees have single leaves, while ash have several small leaflets on a central stalk. It could also be a result of wet weather, and a fungus rotting the developing seeds – in which case its pretty harmless, if ugly. The same is true of the Ash flower gall – ugly but harmless to the tree. First, thank you for the time you spend helping us maple tree lovers. We have three maple trees growing in large containers on a NYC terrace. The newest in a two year-old coral bark maple. While everything else is starting to bloom, this tree is not. There are undeveloped buds on the branches but no new activity. There is a large dark purple discoloration on the trunk, starting where the primary trunk splits into three vertical smaller branches. It is spreading up the branches. There are no other symptoms (no sap, no wilt, no bugs) other than the discoloration. What is this? Is this tree doomed? Is there anything we can do except replace it? Thanks Tim, glad to help plant lovers. Sounds like a Sango-kaku Japanese Maple, right? Lovely tree – I have one in a container too, as it happens. It should be budding out by now, and that discoloration sounds bad. I suggest you take a sharp knife and remove a small, vertical sliver of bark down through that area to the wood below – the bark is quite thin. Is the underside of the bark white/green or brown? If it is brown, as I suspect you will find, then its a canker – a dead area caused by a fungus that perhaps entered through an earlier pruning cut. If this area covers a lot of the diameter of the trunk, explore with your knife, and if it is mostly brown underneath, then I am afraid it’s time to go shopping for a new tree. these kinds of infections are just a chance event. If it seems healthy under there, then I am not sure. You had a very cold winter up there this year, yes? On a terrace in a pot the roots and/or buds could have frozen and died, so give it a bit longer, but if nothing happens – like new buds developing on the stem – then it’s still time to go shopping. 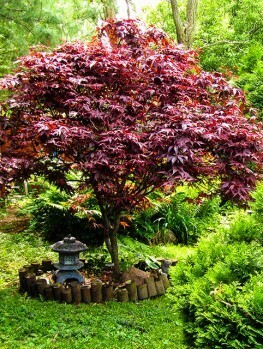 We have a good selection of Japanese Maples here on the site – including Sango-kaku. . . . Sorry about your tree. My three-year-old autumn blaze Maple has a gash on the trunk where the bark is now coming away from the tree. we’ve had a lot of rain and it looks as though it has some type of rot going on. Should we be pulling the bark off the tree to dry it out? It’s about 2 ft long a 2 inch wide area. Nice Tree, Autumn Blaze, and worth trying to save. You say the dead area is 2 inches wide – how much of the trunk is that? If it is just a modest amount, here is what to do. Take a very sharp knife – like a sturdy box cutter – and carefully trim away the damaged parts – don’t pull it off, cut it away, until you reach healthy bark all around it. Taper the top and bottom so you have an elongated oval. Clean out any dead parts, so the whole oval is surrounded by healthy white/green tissue. That’s it. Don’t put any kind of paint or treatment on it. Clear grass and weeds from the area around the base of the tree to make a 4 foot clear circle around it. Don’t plant anything there. Feed with a tree fertilizer, and cover the soil with a rich organic mulch like garden compost, or rotted animal manure. Don’t let the tree dry in the summer. You should in time see new tissue start to grow around the edges, and eventually the whole area will cover over with scar tissue, and finally disappear almost completely under new bark. Keep it clean while it is healing – don’t let dirt and insects get into the gap by brushing them out with a soft brush. If that 2-inch wide strip is more than 1/3 of the trunk diameter then it may not be worth trying to save the tree – but you can give it a go. Hi I have a red maple,,,, the truck has a split in it and it looks like something is seeping out,,how can i fix this? That’s a tricky one. If there is foamy liquid coming from the crack it is probably ‘slime flux’, an incurable bacterial disease. The foam may small ‘beery’ or of rot. The tree should be removed, and the wood burned, not chipped, which can spread the disease around. On the other hand, there is a lot of sap flow at this time of year, so if the liquid is clear, not-bubbly, and tastes a little sweet, it is probably just sap coming from the split. If the tree is young you can fix the split by putting one or two bolts through the trunk, from one side to the other, and fitting them with diamond-shaped washers, placed points running up and down the tree. Cut away the bark underneath the washer, so it sits directly on the wood. Tighten the nut or nuts until the crack closes up. That’s it. In a few years the crack and the washers will disappear beneath the bark. There is no treatment as such. It’s affected by the weather in the season – can go away for years, and then come back under suitable weather conditions. To reduce spread, collect and bag or burn all the leaves – don’t put them into compost or mix with other leaves to mulch. 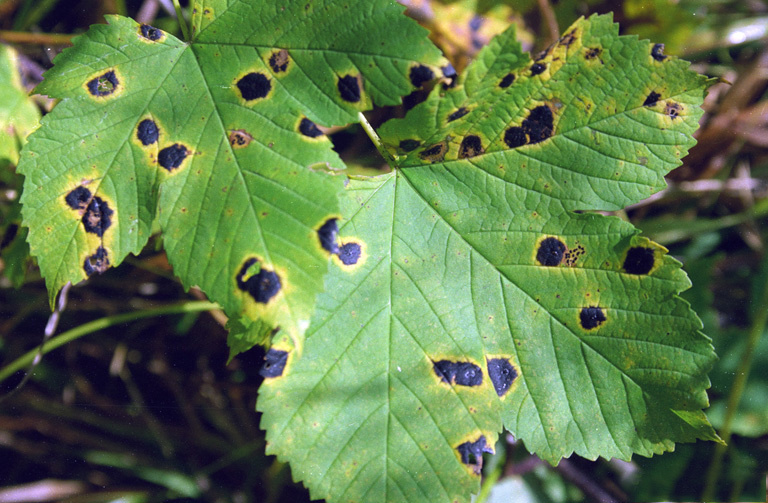 The spores overwinter on infected leaves, and then re-infect new leaves the next year. This disease normally causes no long-term harm, as it attacks after the growth period is pretty much over, and the buds are formed for the following year. I have a 45 year old sugar maple that always had perfect leaves every year until this spring. Now there’s hardly any leaves on it and the ones that started curled up and died. Live in northwest corner of Iowa. No digging around the tree for 20 years. Did you notice it coloring early in the fall for the last few years? 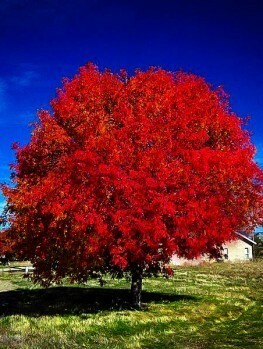 Earlier than other sugar maples? That is a symptom of verticillium wilt. Trees take several years to die, and then one spring. . . Take a few branches with curled leaves, about an inch or so in diameter. Cut across the stem at a sharp angle. Is there a brown ring in the wood, close to the bark? If so, that is a definite sign that it is Verticillium. If the tree is as showing as much damage as you say, I don’t think it will live much longer – sorry. If there is still a fair amount of foliage left, having a tree company come in and do a deep root feeding can often help, but its not guaranteed. I have three maple trees. Two in the back yard right next to each other. One in the front yard. One tree in the back has the brown spots and as soon as the leaves appear in the spring they start falling off. I haven’t noticed spots on the leaves in the front yard but the same thing happens. As soon as the leaves appear they start falling off. That tree is quite old. An arborist said it wasn’t dying. He said that tree is anywhere between 75 and 100 years old. I love my trees and the shade but the leaves are unsightly in my gardens and I can’t keep up with picking them up. It’s really bad. Nothing has been done around the trees except mulch. Which I didn’t start putting down until a couple years after we moved in and started my gardens. The leaves were falling off previous to that. I’m in Southeast Michigan. Help !!! Is there anything this avid gardener can do ? No there is nothing you can do, except pray for different weather. This has been a problem for several season now, and it takes several unsuitable ones to reduce the spore population, but it will almost certainly disappear again. Seems like it started around 2010 in many areas, so it has been a while. If you can get everyone around you to destroy the leaves in fall, that is the only way to reduce it – difficult I know, but at least your trees won’t die! I have some sugar maples that are dropping leaves this spring. Is this due to large amounts of rain we’ve been having. Seems to be very widespread this year. Rake up as many leaves as you can this fall, don’t compost or mulch them, and try to get neighbors to do the same. On our family farm we have a huge maple (not sure what kind it is) that has been there for over 50 years. This year we are noticing that there are black spots on the leaves and some of them look like they are wilting and rolling up while still attached. We have never had any problems and the tree is huge which provides the only shade in the yard. I pray there is something we can do because it’s a gorgeous tree and has been there for as long my mother can remember. Thank you. Large, coal-black spots, right? Sounds like Tar Spot, described in the article. This has become increasingly common in many areas in the last few years, due to a series of damper summer, suitable for the spread of this fungus. Also, once it is in an area, it spreads. Don’t worry – it has little or no serious impact on the tree – although it does look bad. Put a big effort into cleaning up and burning all the leaves as they drop – which they will do early, and especially in fall. 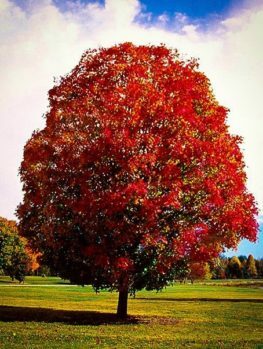 This will break the cycle and since you are on a farm and its the only affected tree, if you destroy all the leaves you have a good chance it won’t come back next year. Silver maples pruned in March 2018. Now that leaves and new growth are present, new growth branches are falling off particularly with windy days. Leaves don’t appear to have any dark spots or areas that are eaten. What night be the cause of branches falling off? Unless this is a large quantity of branches, it sounds normal. After hard pruning there will be many new shoots, more than the tree needs. So weaker ones will begin to die, and will then easily dislodge in windy weather. As well, the new growth is very soft, so more prone to breakage. I expect this will stop as the branches grow out and mature. My very tall maple–silver leaf, I think–has spider mites and tar spot. What can I do to eradicate the mites and prevent the tar spot from emerging again this year? It’s a bit late to reduce the risk of tar spot coming back. Ideally the leaves in fall should all be collected and destroyed – not composted. By now they are probably spread around, ready to release new spores. Mites are usually worse during drought, so keeping your tree well-irrigated, and spraying the foliage with water regularly can have a big impact. Beyond that you would need to spray with a miticide, which on a large tree would probably mean hiring an arborist for accurate diagnosis and treatment. It’s not life-threatening, just disfiguring, so maybe you want to just live with it? Spraying the trunk and branches in late winter with horticultural tar-oil is another control possibility – the adults and eggs overwinter in the bark. My maple has developed the black tar spots. We learned our error by putting leaves around it in the winter and will not do that again. However, the leaves have this odd crystal looking red and white growth on them, may be a fungus. I cant seem to find what this is. I have a picture but cannot post it and all my research is not telling me what it is. Any help would be amazing. Take a look at this. https://en.wikipedia.org/wiki/Vasates_quadripedes. I suspect these pretty common and harmless mites is what you have. They come and go depending on the season, but the damage is purely cosmetic. Hope the tar spots stays away! I have a 10 year old maple on the west side of my house in Ontario,Canada. It looked amazingly healthy all spring despite the recent drought conditions. The tree get a lot of strong, west wind. Two days ago I noticed that quite a few of the leaves were turning brown and other brown leaves were on the ground . When I looked closely I noticed that where the stem of the leaf joined the main part of the leaf the stem had darkened and started to shrivel. No dark spots visible on the leaf itself. I have started to slow water the tree for a couple of hours each day since I noticed the leaves turning brown. I should have done this sooner. Is the tree just dropping some leaves to get through the dry period. A 10-year old tree shouldn’t be affected by a short period of drought, unless you have very, very sandy soil. If your watering stops this happening, then it probably was dryness, but if not, it depends on how extensive the defoliation is. If you lose some leaves, but the tree still looks full, then it’s probably not much to worry about, but if it is extensive leaf drop, it could be the beginning of Verticillium wilt. Has there been any digging activity around the roots last fall or this spring? The disease enters through damaged roots. I suggest you keep an eye on it and see how it develops – it’s too soon to make any definite conclusions, so good luck – it’s probably not serious. No digging. Very sandy soil. In that case it sounds like dryness. A tree of that age is not going to die from losing a few leaves – or even losing a lot. If your soil is very poor you should mulch with something rich – animal manure or mushroom compost for example – every year or two. My sugar maple is producing less leafs and the ones that are on the tree are smaller than they use to be. The tree overall seems to have stopped growing. It was planted about 12-years ago. Sorry, but it’s hard to say much definitive without seeing the tree and the surrounding conditions. I might suggest having the tree fertilized with a deep root feeding – many arborists offer this. Fertilizer is injected into the ground under pressure around the root zone. This has the double benefit of stimulating and feeding the tree, and the burst of growth can stop any diseases that may be developing (specifically Fusarium wilt). 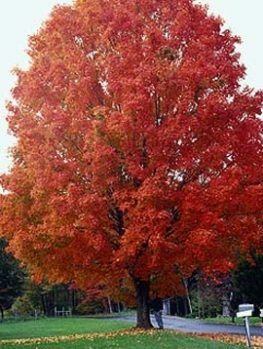 I planted two large 3 1/2″ caliper size Celebration Maples in June 2017 here in the Western New York area, specifically Clarence, NY just outside Buffalo. This spring they budded and leafed out just fine and looked great. However, recently the leaves on both trees are turning yellow with more yellowing at top and the leaves also have some dark spots on them and falling off. We have had a rather hot and very dry summer up to this point and I have been watering them. Am I not watering them enough??? Do you think with increased water they will come back next spring??? I don’t want them to die… please help!!! That’s a lovely tree, and I am sure they will be fine. Larger trees like that can often go through some transplant shock for a couple of years, before settling down. First, I assume that when planted all the burlap was untied and cut away from the top of the root-ball (if they came that way) – that’s important. The dark spots could be tar spot, which is harmless, and increasingly common these days – it’s the early yellowing that is more of a concern. How are you watering? Do you give a long, deep weekly soak over an area a couple of feet larger than the root ball was when planted? If not, adopt that until mid-fall. It’s late in the year now to fertilize, as the buds for next year will mostly be formed, but plan on feeding next year early, with a slow-release fertilizer. I am pretty sure they will be back with a bang next spring – trees take time to adapt to new locations. I have a a 50 yr old silver maple whose leaves began falling shortly after sprouting this spring. Small, curled up, brownish, some black spots and the bark appears to be coming off in strips. There are dead small branches at the outer limbs. From what you have previously said, it sounds like vert. wilt. I’m not sorry as I hate the tree. But it’s on Condo grounds and they won’t want to spend the money to remove it unless they are certain it is doomed. Please tell me it is doomed LOL. It does sound like verticillium wilt – but I suspect the condo will want an arborist report to confirm that it is, indeed, doomed! I suggest you ring around local tree companies and see if someone will come and give a diagnosis and quote you can give to the condo. Hard to say the cause without closer examination, but fungal diseases can cause sections of the leaves to fall out, without any insect pests present. Are other red maples in your neighborhood affected too? Not to worry too much. By this time of year the buds are fully formed for next year – you just won’t see great fall color this year – which is of course a shame. If it happens again next year, try to find a good arborist to visit. I planted a Norway maple as a sapling about 10 years ago which grew like a weed every year until this year. Its about 20 ft tall now, and had lush large leaves every year. This spring it was very late sprouting its buds and the leaves are now sparse and smaller on the lower half of the tree. Our spring was very cold and wet, and at the time I thought may have been the cause. However, none of my other maples of any age show any of the same symptoms. Now that its August, many of its leaves are yellowing and dropping off. Is it a disease or a growth phase? It doesn’t sound good. Has there been any root disturbance, like trenching, or changing the soil level? Did you see any early leaf drop last year? 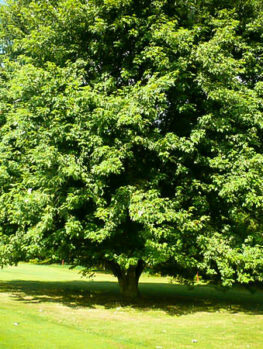 It does sound like Verticillium wilt, which Norway maple can certainly get, is a possibility, but it could simply be natural loss of lower limbs – since you say the upper growth is good, and that is usually where Verticillium symptoms show first. As the upper crown develops, it shades the lower limbs, which weaken and eventually die – so it could simply be that. If the upper crown remains healthy, I would go for natural die-back as the cause. You could prune them off as needed. I planted a Florida Maple tree that I bought at a nursery over the weekend. It is 6 foot tall and branches out at the trunk at 1 1/2 foot. It looks like it has lichens on the trunk. Some of the trunk is a lichen color, like the lichens are part of the grayish colored trunk. I did a scratch test: on the trunk and main leader limb going straight up; the bark looks yellowish not brown and has leaves growing up the trunk and leader limb. The limbs on one side of the looks like they have been cut off, all you see is where the limbs would have been. The other side of the tree is full of leaves and green under the bark on the limbs and twigs. Lichens are not harmful – since the tree is new they probably developed in the nursery, which must have been in a place with very clean area, since lichens are a sign of that. Green under the bark is a sign of healthy bark, so don’t worry. Often the shady side of a tree trunk is different from the sunny side. Remember that you need to remove those lower branches gradually over the next few years, so that you develop a trunk of a suitable height for the situation you have planted the tree into. That is what seems to have been done already – those leaves on one side are re-sprouts, and should be removed, as long as there are plenty of leaves in the crown. At the history museum in St. Cloud Mn the maple tree leaves have stiff grasslike growths on them spike like what is this? This is Maple Spindle Gall, caused by eriophyid mites. If you Google it you will see many photos to confirm that. These are very distant relatives of spiders and ticks, and similar to the red spider mite that is such a pest of houseplants. They inject toxins into the leaf, causing the leaf to form these structures, which create a nice, comfortable home for the mites. They do no harm to the trees, and the incidence of them varies from year to year. When planting a newly planted tree how long should I water if for per day? I put my irrigation hose by the drip line using the spray nozzle on soak for 3 to 8 hours every other day. Trees planted in February are : Jacaranda, FL Maple, and Angel Trumpet. Trees planted in August are: FL Maple, and Christmas Palm Tree. Thank you. Unless you have very sandy soil, and are in a hot area (you must be if you have Jacaranda and Angel Trumpet) you could be watering too often with this regime. I would keep it up for the Maple and Palm, but reduce the others to twice a week. In winter, just check from time to time that the soil is not completely dry – dig down a few inches – and then next year water just once a week on all of them. The Angel Trumpet will tell you if it wants more by wilting a bit. I live in Kansas and have a nurture autumn blaze maple. 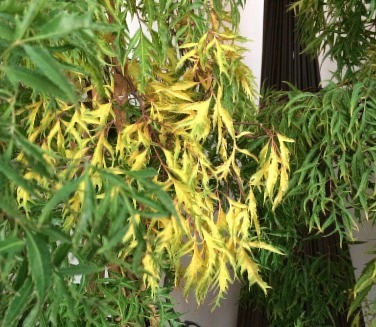 This month is has started to turn yellow and the edges of the leaves are browning. Is this verticillium disease? Hard to tell from those symptoms. It could also be drought or nutrient deficiency. Both of these are more likely on sandy soil, and if the tree is recently planted (couple of years or so). Is it uniform all over, or isolated on one or two main limbs? Verticillium tends to strike on single limbs, not all over. This late in the season the tree doesn’t really need its leaves anymore, the buds for next year are fully formed. See how it is next year, and feed it early next spring with a high-nitrogen tree food – root feeding is best if the tree is mature. Has their been root disturbance around it, or a change in level? That can cause a reaction, and cutting roots with trenches can allow Verticillium to enter. Good luck with it! 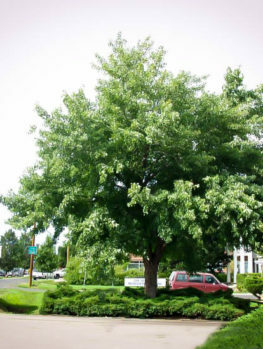 I have a large maple in front of my home that faces south in Castle Rock Colorado. It has turned red each fall for the seven years I have had it. This fall it turned yellow with a light tint of red. The rest of the maples in the neighborhood are bright red. I am concerned there is something wrong with my tree. I am very meticulous with my front lawn. I keep it well water and fertilize appropriately. I want to know if I need to feed the tree or what I can do to make sure I don’t loose it. Any help would be greatly appreciated. I do have pictures, I am not sure if I can send to you or upload. There are lots of reasons why a tree doesn’t color well in a particular year, but illness is not usually one of them – in fact sick trees often color more brilliantly. So I wouldn’t worry – see what happens next fall. Maybe you are more sheltered, so the night temperatures have been a touch warmer – are you in a hollow? The other possibility is the quality of your gardening. Your lawn feeding means your tree is getting a lot of nitrogen, which keeps it producing soft new growth longer into the season. If it is growing more actively it will stay green longer, and might have not been ready when you had the weather conditions that cause red coloring (warm days and cool nights). Anyway, let it go for now, and see what happens next year. Maybe stop feeding your lawn earlier in the season next year. I planted 6 autumn blaze maples on my property last year.. The guy who mows my yard rubbed against 3 of them, takes small chuncks out of them all. He then wrapped the bottoms in tape. “I went out on the property and noticed this”. The tape was still on them. I took the tape off and the bark looks weird and almost wet on one. On the other the bark looks all craked all the way around as if it is peeling off and the last one has a small hole with rot but looks fine other than that. The trees are very much alive and he said he did this early on I’m the year and they are still alive. Should I remove them or wait and see what happens? That is a great shame. Mower/string trimmer damage is a major cause of long-term issues with trees. Wrapping the damage areas in ‘tape’ is also the worst thing to do. You have two choices: since the trees are still young, if you don’t mind the cost of replacement, I would replace them – because of the long-term effects, which can be future girdling of the trunk, killing the trees at a much older age. If you decide to keep them, here is what to do. Get a very sharp pocket knife and carefully trim each wound, removing anything rotting or brown, until you have a clean, light-colored (white or green) area, with no ragged bits, and no bark that is not attached to the underlying trunk. Shape it into something even, preferably like an upright oval, but not if that involves removing a lot of healthy material. That’s it. Don’t cover it, paint it, or do anything more. If after doing this you have removed bark more than 50% around the trunk, then the tree will not survive – replace it. As well, create a circle around each tree, 3 feet across, with no grass. Put mulch over that area – compost, rotted manure or shredded bark. Keep it a few inches clear of the trunk, so nothing touches it. This means the mower guy doesn’t have to come anywhere near the trees, and it will also conserve moisture and provide some nutrients. Young trees should also be fed in spring, with a tree-food blend. Do this immediately if you plant new trees! Good luck with them – everyone should make sure their mower guy never goes near trees with mowers or trimmers! My silver leaf maple tree that is over ten years old was just blooming great and then i saw the leaves starting to come out and now they are all shriveled up and dying.I live on lake but this tree has don well every year and is about twenty feet tall now.What has happened to my tree? Hard to say at this stage, but have you had a late frost in your area, after the leaves came out? See how things develop over the summer, and write back in fall if you still have problems. After frost damage trees will usually produce a second crop of leaves, if it is that.